It’s hard to tell how seriously luxury and sports car buyers are taking plug-in technology. 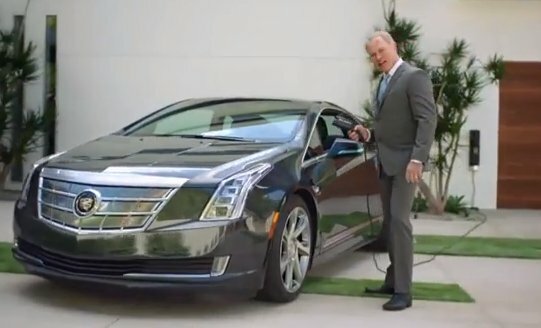 Automotive News just placed the Cadillac ELR plug-in hybrid at the top of its “blunders of 2014” list. Cadillac was taken to task for pricing the car at $75,995 and only selling 1,192 units since its introduction at the beginning of 2014. The styling may have “surprised the world,” but the pricing took it out of consideration for anyone likely to buy one, said Aaron Bragman, Cars.com’s Detroit bureau chief. Tesla Motors may be down in sales on its Model S luxury all-electric car. com and Baum and Associates reported 1,450 units sold in November while InsideEVs reported 1,200 – down from September and October 2014 sales numbers. Tesla doesn’t report those numbers until its quarterly reports come out, but sales may be down and its stock price has dropped lately. One the other side of the coin, German automakers are still taking the Tesla competition seriously and plan to roll out a series of direct competitors between 2018 and 2021 with the Model S and future Tesla products. These new vehicle launches from Audi, BMW, Mercedes-Benz, and Porsche will be priced between $65,000 to more than $125,000 – and represent a total investment of about $7.5 billion for these German automakers. Fisker Automotive and its Wanxiang Group owner will be watching all of it closely as the Karma rolls out again. Analysts, stock traders, and investors will need to have a few questions answered. How much are car buyers/lessees willing to spend on luxury, sporty electric cars? What would it take to get these high-income consumers to take these technologies seriously? Will the US rollback on the 54.5 mpg fuel economy standard by 2025 during the 2017 midterm review? Will declining gasoline prices force the issue? Not necessarily, according to an analysis piece in WardsAuto. Automakers are globalizing their vehicle technologies and emissions regulations in key markets are ruling out allowing for major changes. Europe isn’t backing off its tough CO2 emissions rules. Making changes strictly for the U.S. market could end up costing more money than it would save. Navigant Research thinks global carbon emissions standards will be serious enough to mean that by 2017, over half of all vehicles sold globally in 2017 will be powered by technologies other than conventional gasoline engines. Electrified transportation and alternative fuels will continue to grow, but gasoline will continue to be the leading fuel in year ahead; many of the fuel economy gains will come through fuel-efficient technologies such as smaller engines and turbocharging. Incremental improvements in engines and transmissions, and vehicle weight reduction in as many places as possible, will play into meeting those targets. The California Energy Commission (CEC) is offering $4 million for Applied Research and Development projects “that will advance technologies and strategies for smart and efficient charging and vehicle-to-grid communication interfaces that will provide maximum benefits to both the electricity grid and the plug-in electric vehicle (PEV) market.” The project is aiming to encourage EV drivers to charge when grid demand is low and/or renewable energy sources are abundant. CEC will host a workshop on its PON-14-310 (program opportunity notice) in Sacramento on Jan. 7, 2015. Final applications are due Feb. 6, 2015. The US Department of Energy (DOE) will be hosting a meeting at its Washington, DC headquarters on Feb. 25, 2015, to create a five-year strategic plan for Clean Cities. It’s been five years since such a meeting has happened, joining together Clean Cities Coordinators, DOE staff, national laboratories, and energy and transportation experts. It’s part of supporting Clean Cities’ national goal of displacing 2.5 billion gallons of petroleum per year by 2020. Tesla CEO Elon Musk has been tweeting about a company announcement – the Roadster will be able to travel nearly 400 miles on a single charge, up from about 245 miles. That will come from a new prototype package the company calls Roadster 3.0 with an improved lithium ion battery that provides 31% more energy. Range extension will also be supported by a retro-fitted aero kit to improve the vehicle’s coefficient of drag, and low-resistance tires that are 20% better than their previous version on the Roadster. Royal Dutch Shell’s joint venture in Brazil, Raízen, will be spending close to $1 billion on “second generation” ethanol plants in that country. Brazil’s largest ethanol producer will invest in eight plants before 2024 to increase biofuel output up to 50% to produce biofuel from sugarcane waste. This is happening as several Brazilian ethanol producers have been struggling to stay open – and it could represent more confidence in second generation, advanced biofuels. It looks like California’s regulatory standards on self-driving cars will be delayed. The state’s Department of Motor Vehicles (DMV) announced it will miss a state Senate deadline to establish public regulations for autonomous vehicles by Jan. 1, 2015. Safety concerns are the main reason for the delay; possible regulations will be discussed at a public workshop in Sacramento in late January. In the meantime, DMV will be gathering feedback from industry, academic, and industry groups. There’s much interest on what California does in the absence of federal safety standards or independent organizations testing the safety of these vehicles. Greenbelt Resources was chosen as the “Best Biofuels and Biochemicals Solution” in The New Economy Magazine’s 2014 Clean Tech Awards. The company’s modular small-scale organic waste recycling technology converts food-based waste into consumable products and renewable energy. PortTech Los Angeles had named Greenbelt Resources as one of the top 10 clean technology startups for 2014. China’s southern city of Shenzhen, located next to Hong Kong, has become the latest city to cap new vehicle sales to control smog and traffic congestion. Shenzhen has capped new vehicle license plates at 100,000 a year with an annual quote of 20,000 electric vehicles (which can be adjusted for changes in traffic, air pollution, and car demand). The city follows similar policies enacted at other Chinese municipalities setting quotas on new vehicles: Beijing, Guangzhou, Guiyang, Hangzhou, Shanghai, and Tianjin. 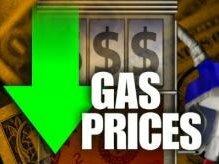 Gasoline price drops – On Friday, AAA Daily Fuel Gauge Report said that US regular gasoline prices had averaged $2.32 per gallon versus $3.26 one year ago. As explored in another Green Auto Market article this week, gas prices will go up quite a bit but it could take about five years for that to happen. Sales of hybrids, electric vehicles, and natural gas vehicles have been impacted by that market force. Making the case for investing in alternative fuel vehicles is getting tougher for fleets and consumers, but there are still a few solid reasons for going in that direction. Tesla battles dealers – The Georgia Automobile Dealers Association has been the latest state dealer group to battle Tesla Motors’ legal ability to directly sell its cars to consumers outside independent franchised dealers. Earlier this month, Georgia auto dealers testified before a state administrative law judge to make that case. Tesla is slightly ahead of dealer associations on this issue in several states, but has been barred in a few of them (such as the sizable market of Texas). Google rolling out self-driving cars – Google’s launch of a test project featuring its own self-driving pods back in May of this year fueled a heated debate that went viral on the internet. Autonomous vehicles, also known as driverless and self-driving cars, led to significant studies being launched (such as Hands off the Steering Wheel), automaker announcements, and extensive media coverage. It will take a few years to see autonomous vehicles next to you on roads, but things are changing. Infrastructure growth – In the past year, alternative fueling and charging stations saw some growth in the US – compressed natural gas (CNG) stations increasing 150 stations to 794; electric vehicle public charging stations increasing 2,102 to 8,814; propane autogas increasing 44 to 2,715; and liquefied natural gas increased 19 to 64 stations (according to Clean Cities Alternative Fuels Data Center). Clean Energy Fuels played a big part in the natural gas station expansion; and California started seeing more hydrogen stations open up. Ridesharing service Uber has become Public Enemy No. 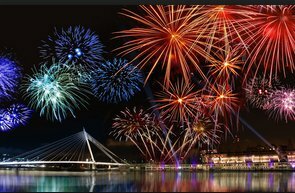 1 this year for the taxi industry and other ground transportation services. This San Francisco-based network company makes mobile applications that connect passengers with drivers of vehicles for hire and ridesharing services. Taxi drivers have protested this year in US and European cities; they’re furious that Uber drivers don’t have to pay the steep prices for taxi licenses that taxi drivers end up paying off over several years. India will decide if Uber can access metro markets in that country. Other ridesharing services such as Lyft and Sidecar face similar battles with cities that fear ridesharing will transform the taxi business and take away the revenue that comes from fees paid by taxi owners every year. Luxury plug-ins had a significant year with the BWW i8 joining the i3 in BMW’s electric vehicle offerings. The plug-in hybrid i8 sells for $136,000 and has the same performance as a BMW 335i. As of Nov. 30, the i3 had sold 5,079 units in the US for 2014– pretty impressive for an expensive luxury electric car. Propane autogas had an impressive year in school bus fleets, police cars, utility trucks, and in UPS’ decision to bring in 1,000 propane-powered delivery trucks to its fleet. Fleet managers are making a business case that propane-powered vehicles are worth the investment with emissions reductions, fuel cost savings, and supporting domestic fuel providers. ACT Expo saw attendance growth In Long Beach, and significant partnership announcements including joining up with Electric Drive Transportation Association for the 2015 event. Other clean transportation conferences did very well, too. AltCar Expo saw growth in attendance with a strong Santa Monica, Calif.-conference in September and through its partnerships with the Bay Area and Dallas events. Other successful conferences were North American Green Fleet Forum, presented by Sacramento Clean Cities Coalition; CleanTech OC’s annual conference and clean transportation event earlier this year; Plug in 2014 in San Jose, Calif.; and CALSTART’s annual conference and Blue Sky Awards. The Renewable Fuel Standard decision by the US Environmental Protection Agency (EPA) was once again put off on biofuel production and gasoline blending until next year – nearly one year after deciding to extend that decision on production volume. The biodiesel industry has been feeling the pinch, and corn ethanol has shifted to overseas markets. Advanced biofuels like biodiesel and cellulosic ethanol will take longer than expected to reach higher production volumes. While it didn’t get all that much media attention, a major global alliance took a big step forward. The United States and China, which together produce 45% of the world’s carbon emissions, made an agreement to extend their greenhouse gas emission reduction targets farther than before. Details on the US-China greenhouse gas emissions agreement is being decided for next year. China’s economy is booming, and workers are moving to cities to take jobs and housing. They’re buying a lot of cars, too. All of this producing a huge volume of emissions at power plants and vehicles. The economic power of the oil industry continues to be more influential than any other business sector in the world; that includes OPEC and non-OPEC oil-producing countries like Canada and Russia, and supply chain partners such as oil refineries. When the price of oil jumps up or down, the economic rippling effect is felt throughout the world; sales of hybrids and electric vehicles are affected and geopolitical issues, such as alliances between countries, are impacted. When oil, gasoline, and diesel prices spiked in 2008, the term “fuel volatility” became commonly known by fleets and consumers. Sales of hybrid electric vehicles jumped up. Investment in natural gas vehicles and infrastructure – and to a lesser extent propane autogas – had a resurgence not seen since the early 1990s. The oil price spike in the summer of 2008 helped push along the US financial market collapse that started in September of that year – and it also supported the introduction of plug-in electric vehicles (EVs) by the end of 2010. Volatility in fuel prices has given car shoppers more concerns for fuel efficiency and more interest in EVs and other alternative technologies. Oil prices, and gasoline and diesel, did drop back down in 2009 but came back up again in 2011. Those prices stayed up and fairly level until dropping nearly 50% in the second half of 2014. Even though the US and the world had been hit with the Great Recession, the first EVs produced in fairly large numbers were introduced by major automakers before the economy started recovering. When the Nissan Leaf and Chevrolet Volt were rolled out in late 2010, advertisements for the Leaf and Volt emphasized freedom from oil addiction (such as driving by gas stations) and environmental benefits. Tesla Motors had introduced the limited production volume Roadster in early 2008; its Model S, launched in the summer of 2012, had been able to generate enough enthusiasm long before roll-out to support the company’s 2010 initial public offering and large investments by Daimler and Toyota. Major automakers expect that within the next five-to-10 years, oil price increases and the possibility of more motor fuel taxes, will drive up prices at the pump. Increasing environmental regulations and fuel economy standards, and the drive toward sustainability targets by corporations and governments, are also influencing those capital investments and new vehicle planning. Major automakers, including commercial truck manufacturers, are going to continue to invest in alternative fuel vehicles and advanced vehicle technologies. Along with fuel price trends, automakers are planning for a fast-changing transportation landscape where they’ll be selling less new vehicles and partnering with other stakeholders in carsharing, autonomous vehicles, urban planning, vehicle safety improvements, and reducing traffic congestion gridlock and air pollution. If you study the Forbes’ list of the world’s biggest public companies, you’ll see that major oil companies are high on the list and that the annual ranking is becoming more expanded and globalized. China, which became the largest importer of oil in 2013, plays a very visible role on this list. No. 1 on the list is ICBC (Industrial & Commercial Bank of China), which funds a lot of petroleum production. Number 10 on that list is PetroChina, which refines crude oil and petroleum products and is engaged in the exploration, development, production, and sale of crude oil and natural gas. PetroChina was also the largest emitter of greenhouse gas emissions in the world during 2013. Advanced vehicle technologies are in the pipeline, but for now, the power of the global oil industry and its impact on emissions can’t be ignored. As for the near future, and for the long-term, here are a few market forces to follow that likely will be influencing motor fuel prices……….. While crude oil has been selling for about $55 lately on the WTI exchange, analyst firm Trefis forecasts those prices will reach about $100 per barrel by 2020. Recent price declines in oil should extend for a longer period of time than Trefis had originally predicted; a slower growth demand scenario and the weakened price controlling power of OPEC will extend these current prices longer, but they will be going up to the $100 per barrel range in about five years. Rapid growth from non-OPEC supplies relative to overall demand has been at the heart of the recent oil price drop. Approval of the Keystone XL pipeline in Washington, DC, appears less likely to happen. Lower gasoline prices and skeptical comments from President Barack Obama may be behind it. While it may be very good for Canadian oil companies, it’s not going to provide much for American consumers, Obama said. That’s the fourth non-supporting comment the president has made publicly since early November on the six-year old proposed pipeline that would run between Alberta and Texas. Several analysts have said that falling gas prices support the argument of Keystone XL pipeline opponents that it’s not worth the investment; Canadian oil isn’t necessary with all the global oversupply that’s already out there. Tesla Motors’ stock price fell below $200 on Tuesday of last week after reaching a high point of $284.89 in September. The price has continued to move back up in the past few days (finishing at $222.60 when the market closed yesterday). The price started declining during the fall in line with a 50% drop in crude oil prices since August. Earlier in December, the average US gasoline price dropped to $2.75 per gallon versus $3.27 a year ago. Along with dropping gas prices, analysts think Tesla stock price decline relates to the company scaling back production of the Model S by 2,000 units after an assembly line took longer than had been planned for. Another development was pushing back the delivery date of the long-delayed Model X crossover to the third quarter of 2015. President Obama has signed The Tax Increase Prevention Act of 2014 extending the natural gas vehicle fuel credit of .50 cents per gallon equivalent through the end of this year. Natural gas refueling equipment has received a tax credit through the end of this year identical to one being granted to electric vehicle charging stations — a $1,000 credit for home refueling appliances, and a 30-percent investment tax credit up to $30,000 for businesses. US Environmental Protection Agency (EPA) regulations on electric power plant carbon emissions will likely be dragged out a long time. The January 8, 2015, deadline may be missed due to being late in the process of receiving public comments. It’s also likely to hit a roadblock from a more hostile Congress over the next two years. This has been possibly the biggest move by the Obama administration on environmental policy, and it faces an uphill battle. On Friday, the EPA did set the first national standards for disposal of coal ash from coal-fired power plants; coal ash has been classified as solid waste instead of a hazardous material. EPA says the final rule establishes safeguards to protect communities from coal ash impoundment failures and establishes safeguards to prevent groundwater contamination and air emissions from coal ash disposal. Second generation biofuels should reach $23.9 billion as a global market by 2020, a combined annual growth rate of 49.4% from now until 2020. The market report by Allied Market Research says that while biodiesel is the highest produced second-gen biofuel, cellulosic ethanol should surpass it within the next two years. North America holds the largest regional market share, followed by Europe. Growth drivers should be favorable regulatory policies and the fuel’s environmentally friendly nature. Job training programs continue: I-CAR has launched the Alternative Fuel Vehicle Damage Analysis and Safety (ALT03) The live, instructor-led program is worth three credit hours and is designed to enhance a collision repair professional’s understanding of how to safely approach all types of alternative fuel vehicles. “Each vehicle will require specific knowledge about the different risk avoidance elements engineered into these vehicles from a propulsion system perspective,” says Josh McFarlin, I-CAR Director of Curriculum & Product Development. “This makes building knowledge on the different alternative fuel vehicle types extremely important. Carbon War Room has merged with Rocky Mountain Institute in a campaign designed around combatting climate change and accelerating demand and financing for low-carbon solutions that are technically viable and cost effective. Carbon War Room, co-founded by Virgin Group Chairman Richard Branson, has been active in clean transportation including its alliance with Freight Efficiency.org. Rocky Mountain Institute has conducted major studies on electrified transportation. Earlier this year, the two organizations worked on a joint project, the Ten Island Challenge, that’s supporting transitioning Caribbean island energy systems from imported diesel to renewable sources such as wind and solar. Beverage delivery fleets are increasing fuel efficiency. Coca-Cola, PepsiCo, and Dr. Pepper Snapple Group have increased the fuel economy of their fleets by 12.6% since 2010. The improvements come from an industry-wide initiative in which the three beverage companies agreed to share proprietary data on their truck fleets with the American Beverage Association. Tesla Motors next week will start a pilot battery swap program with Model S owners. They can set an appointment and show up at the Tesla shop in Harris Ranch, Calif., which is across the street from a few Tesla Superchargers. Right now it’s taking about three minutes to swap these batteries due to the titanium and hardened aluminum ballistic plates shielding the battery pack; the goal is to reach one minute for the swap through further automation and refinements of the vehicle. It’s taken a long time, but Nissan is getting ready to roll out its NV200- based taxi cabs on the streets of New York City. April 20, 2015 is the start date of the city’s Taxi of Tomorrow program, and it follows a stream of public debate and legal challenges. Nearly all of the older Ford Crown Victoria taxis on the streets of New York will have to convert over to the modified Nissan NV200 vans. Advocates of the NV200 cite benefits for taxi fleets including more room and better visibility for passengers and improved fuel economy for fleet operators. Tesla CEO Elon Musk’s “hyperloop” high-speed rail project just issued a 76-page report. The project, which is being developed through another of Musk’s companies, SpaceX, acknowledges the project is still in its infancy, but this is the first time since the announcement last year that more details and research findings have been revealed. Gasoline and oil prices have seen sizable drops recently. Gasoline in the US lately has been averaging $2.41 per gallon versus $3.23 a year ago. As of Dec. 15, WTI crude oil was $55.96 per barrel versus $97.18 a year ago. The consensus opinion among analysts is that petroleum prices should stay down for the next year or so, and will eventually go up to record high prices. That could be somewhere around 2020 through increased government taxes and reduced oil supply driving the pump price of gasoline up to around $10 per gallon. In the meantime, there has got to be a better marketing tactic for reaching fleets and consumers and their decision-making process. It looks like reducing greenhouse gas emissions, gaining more freedom from oil dependency, and supporting advanced vehicle technology innovation would be the best ways to go. A new study by the Union of Concerne d Scientists (UCS) offers some convincing resources, as does development of solar energy storage systems. UCS has calculated that electric vehicles (EVs) have less “wells-to-wheels” emissions than they did a year ago. Top-selling Nissan Leaf increasing its electric range from 73 miles to 84 miles has helped, and the arrival in the past year of more energy efficient EVs like the BMW i3 has played a part in the improvements. Another UCS study, the “State of Charge,” finds that electricity production is getting cleaned up through reduction in coal generation and increasing renewable energy – helping EV makers and drivers meet their goals of reducing emissions and fossil fuel consumption. Solar energy has huge potential for leading the renewable energy front, but it’s still behind wind energy in the US as a source currently being tapped into by utilities. For both solar and wind, one of the biggest challenges for market growth has been the capacity to store that power when the sun goes down (or is limited by storm clouds) and when the wind fades away. These are fluctuating, intermittent energy sources that need storage systems if they stand a chance of meeting load demand and gaining the financial backing they need. A new study by GTM Research forecasts the market for solar energy paired with energy storage will surpass $1 billion per year in revenue by 2018 in the US. Installation of 318 cumulative megawatts of storage capacity through 2018 will come from state incentives, falling battery costs, net metering changes, and solid growth in the solar photovoltaics market. Two developments play a part: California’s mandate to procure 1.3 gigawatts of energy storage and Tesla’s Gigafactory will mean that capacity for energy storage will soon reach a tipping point. A federal 30% Investment Tax Credit (ITC), available in certain situations, is also expected to help meet that $1 billion forecast – up from its current $42 million annual revenue. California and Hawaii have been the major growth markets for solar power in the US, and more incentives are expected to show up. California, New Jersey, and New York have been offering incentive programs. California’s Small Generation Incentive Program has supported several megawatts’ worth of solar-plus-storage to date. It’s typical to see incentives for adding solar power to homes and commercial properties, and occasionally these programs are tied into EV ownership. Solar-powered canopies with charging stations have taken off in California and other states; and solar companies have made marketing arrangements with automakers to entice EV owners to install solar on their homes – such as SolarCity has done with Honda through its discount solar financing program. If you spend time with young professionals who carry out marketing-communications duties in their jobs, you’ll likely hear about social media sites that are taking off. Lately, that’s been led by Instagram and Pinterest with their visual photo board and video streaming templates. YouTube still dominates the video-sharing front (which has been embedded by its owner, Google), followed by Vimeo. Google+ has been seeing gains in its competition with Facebook; though Facebook has a ridiculously high membership number – 1.2 billion out of 7.1 billion people on planet Earth regularly use Facebook. For companies looking for positive reviews from their customers and increasing search engine rankings in their local markets, Yelp and Foursquare are the leaders. My experience has been that Twitter and LinkedIn make for the best use of time for business-to-business (B2B) marketing and networking. 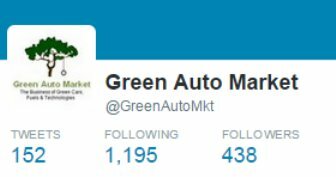 To get a look at my sites, search for @GreenAutoMkt on Twitter and Jon LeSage, LeSage Consulting on LinkedIn. I also moderate a group on LinkedIn called Clean Transportation. On Twitter, Green Auto Market is now following nearly 1,200 individuals and groups and is being followed by 438. My LinkedIn page has connections with more than 500 people. Twitter and LinkedIn seem to work best for networking with groups of like-minded people. LinkedIn calls itself, the “world’s largest professional network.” Twitter and LinkedIn send users suggested people to make contact with who share interest in similar issues. Along with clean transportation groups, some of the followers and connections have come through social media advocates and content creators; automakers and dealers; freight transportation companies; carsharing and ridesharing companies; transportation planners; autonomous vehicle advocates; and solar power companies. Some of my colleagues complain about social media sites basically being a waste of time; or the source of annoying experiences that may include getting pulled into a debate that goes nowhere. Another commonly heard complaint usually comes from Facebook experiences – that might involve a group of friends and an ex-significant other from high school or college. That can get ugly and lead to people being blocked, or leaving Facebook behind. All things considered, social media has become something like what used to be American institutions for social contact; years ago, that might have been pool halls, bars, gentlemen’s clubs, and union halls. These days its more likely to be a Starbucks location, online dating sites, and mobile apps for social media. If you’re spending time and energy getting the word out on your consulting practice, newsletter, or causes you’re quite passionate about, don’t ignore social media – and consider what you can gain from being active on Twitter and LinkedIn. 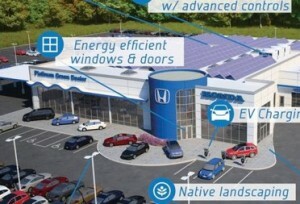 Honda’s sustainability drive is being carried forward to its dealer network through its Green Dealer Guide resources. The 93-page guide offers instructions to Honda dealers on making their operations more energy efficient. Methods include installing high-efficiency lighting, using climate-control systems, managing water use, and using renewable energy sources like solar power. This strategy goes well with Honda’s corporate blueprint on environmentally sound practices – which has been impressive enough for the company to win several “greenest automaker” rankings from the Union of Concerned Scientists. The guide has been in the works over the past three years, and now offers its network dealers techniques on saving energy and money. One example is adding an automated thermostat and adjusting lights after business hours, which can save the dealer $7,000 per year and would cut energy consumption by at least 10%. Convenience, economy, increased awareness, and driving fun and reliable cars are the main reasons Renault-Nissan surpassed its 200,000th zero-emission vehicle (ZEV) in sales, according Carlos Ghosn, chairman and CEO of the Renaualt-Nissan Alliance. Ghosn is very good at championing the cause and made some impressive statements in his LinkedIn post…… The Nissan Leaf is by far the best selling its electric vehicle worldwide – so much so that sales up 20% this year. The Leaf, Renault Zoe and other zero emission vehicles in the automakers product lineup have been driven about four billion kilometers – enough to circle the earth 100,000 times! Two non-internal combustion engine vehicles made this year’s top rankings in Wards Auto’s “10 Best Engine” annual listing. The BMW i3 was the only one of four battery electric vehicles evaluated for the contest to make the cut. Judges liked the power options, including the i3 Rex gasoline range extender edition. The Hyundai Tucson Fuel Cell also made the top 10; the panelists liked how Hyundai has packaged the fuel-cell stack under the hood – helping to make the entire ownership experience similar to driving a regular internal combustion engine vehicle. Here’s a huge opportunity: only 4% of companies surveyed by GE Capital have alternative fuel vehicles in their fleet, but more than 55% plan on adding them in the coming years. That comes from a national survey of 409 executives at middle market companies who have responsibility for their company’s vehicle fleets. Tesla China President Veronica Wu has resigned from her position with Tesla Motors after less than nine months in the job. No details have come out yet on why this might have happened. “We remain confident in the Chinese market,” the company said in an e-mailed statement. Having trouble managing your analysis of company and fleet greenhouse gas emissions (GHG)? Here’s a guide for corporate environmental health and safety (EHS) officers on approaching methods for accurately calculating GHG emissions for reporting purposes. Regulatory uncertainty means that companies need to stay current on the latest and best methods. Two leaders from Alabama Clean Fuels Coalition have been named to the Clean Cities Hall of Fame. Executive Director Mark Bentley and President Phillip Wiedmeyer were inducted by National Clean Cities Co-Director Linda Bluestein while representatives from nearly 100 Clean Cities coalitions gathered for the annual coordinator workshop. In 2013, Bentley and Wiedmeyer lead the Alabama coalition as it saved more than three million gallons of petroleum and averted more than 12,000 tons of greenhouse gases through deploying alternative and renewable fuels. California Energy Commission (CEC) is receiving applications for funding medium- and heavy-duty advanced vehicle technology demonstration projects. Those applications will be received through Jan. 29, 2015. Demonstrations receiving funding must enhance market acceptance of advanced vehicle technologies that will lead to vehicle production and commercialization, reduce greenhouse gas emissions, and reduce petroleum use, according to the CEC. France is pushing for a huge change in its car ownership model – getting rid of diesel-powered cars. About 80% of French motorists drive diesel-powered cars, so the government is launching a car identification system to rate vehicles by the amount of pollution they emit. Taxation is the method that will be used to redirect consumers to more ecologically sound choices. Only a third of diesel-powered passenger cars have lower cost-of ownership than their non-diesel counterparts. That’s down from 46% of diesel vehicles being cost effective in the 2013 edition of Vincentric’s Diesel Analysis study. Of the 35 diesel vehicles included in the study, only 11 have lower ownership costs than their all-gasoline counterparts. Of these 11, 10 were luxury models – making it even tougher to save any money during diesel vehicle ownership. Is the hydrogen fuel cell vehicle the winning technology of the day, or is it plug-in electric vehicles? Natural gas or renewable natural gas? The landscape shaped by regulators, OEMs, infrastructure players, and legislative officials may be evolving into more of a level playing field – according to speakers last week at the CALSTART Annual Meeting and Blue Sky Award ceremony in Los Angeles. Speakers acknowledged that the regulatory environment is certainly very challenging with California’s AB 32, low carbon fuel standards, and cap and trade credits; the status of Renewable Fuel Standard rules and credits; phase two of federal standards for heavy-duty vehicle fuel economy and emissions coming up; details on the US-China greenhouse gas emissions agreement being decided next year; and air pollution from goods movement and its impact on disadvantaged communities and others working at, and living near, ports and major interstate highways. 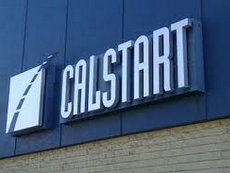 CALSTART’s founding chairman and current president of the California Public Utilities Commission (PUC), helped put things in perspective. When he served as president of Southern California Edison during CALSTART’s creation in 1992, Michael Peevey said that all of the targets being hashed out by states and federal agencies seemed unattainable back then. Now the decisions are becoming more intricate, he said – such as whether the PUC should lift its ban on electric utilities deploying their own electric vehicle charging stations. The tension between California and the federal government (and automakers) was more of a battleground in the early days of CALSTART, but that is getting worked out. Grundler made some humorous comments about it while participating on another panel with Richard Corey, executive director of the California Air Resources Board; that came across in his comments on California considering itself its own sovereign nation and having to accept that fact that its slipped from the seventh largest economy in the world to the eleventh. Another colorful moment came up when Dave Barthmuss accepted a Blue Sky Award for his company, General Motors. Barthmuss acknowledged that he did look familiar to people from having been featured as the GM spokesman in “Who Killed the Electric Car?” While Barthmuss looked like one of the bad guys is that influential movie, things seemed to have changed. After taking the award for GM’s full suite of plug-in vehicles and its clean manufacturing, he was pleased to share his own pride in being an electric vehicle driver and for being part of efforts to get CALSTART employees to start driving Chevy Volts to work. Frito-Lay was given a Blue Sky Award for its large-scale commitment to alternative fuels; the company has made a strong investment in compressed natural gas and electric vehicles to its fleet and with its partners. Caterpillar Inc. was honored for developing and commercializing its Off-Road Large Size Hydraulic Hybrid Excavator. The hydraulic hybrid excavator captures and reuses energy that would normally be lost during earthmoving operations and reduces fuel consumption and CO2 emissions. As acknowledged during the annual CALSTART annual meeting and awards presentations, facing air pollution at freight corridors and ports is a serious challenge. Workers and local residents are prone to serious health hazards including asthma, lung cancer, and emphysema from toxic air pollutants. It is getting better at the ports of Los Angeles and Long Beach and the entire southern California region; the cancer risk has dropped 65% since 2005, but it’s still considered to be too high and one of the worst in the nation. Incentive programs and cleaner fuels have slashed diesel emissions from trucks, ships, and other vehicles. For anyone living and working near the ports, there continues to be a strong demand for air quality to get better. Two meetings in the Los Angeles area last week gave me some hope for the future of clean transportation at the largest port area in the US. On Monday afternoon, PortTech Los Angeles, a non-profit organization funded by the Port of Los Angeles, held its annual open house meeting. Guests were able to see PortTech’s expanded office facilities and view table displays from startups in PortTech’s newest portfolio of companies. Like LA Cleantech Incubator, PortTech helps cleantech entrepreneurs go from early startups to thriving businesses. Member companies are in a good place to support PortTech’s vision of advanced, clean technologies serving the port community. One of the displaying companies, Transpower, is manufacturing battery-electric drive systems for Class 8 trucks. The electric drive system offers lower lifecycle costs than diesel engines and is well suited for port drayage trucks, local delivery trucks, and refuse collection vehicles. NorthSouth GIS LLC (NSG) designs and deploys geospatial systems for ports. The company integrates these systems with other port systems, populates them with data, devises processes, and trains personnel with a focus on long-term sustainability. 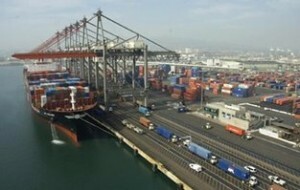 In September during the 5th annual PortTechEXPO, cleantech companies were able to connect with business prospects at Southern California’s ports and explore opportunities with ports worldwide working to achieve a more sustainable future. Another meeting last week focused on a test project for cargo trucks serving the ports. On Thursday, the e4 Mobility Alliance, which is managed by the Los Angeles County Economic Development Corp., hosted a meeting featuring Dennis Rodriguez, the Southern California account manager for Siemens. Rodriguez gave a presentation on electric trucks participating in a test project in Carson, Calif. Siemens is providing electric drive systems that will operate on a catenary system, similar to what you see powering metro buses in San Francisco and other cities. Along with the overhead external conductive box and cable system that Siemens is providing, Volvo Trucks is supplying test freight carrier trucks. For Siemens, this technology has proven to be safe and efficient; trucks participating in previous tests have been able to perform at maximum weight loads and speeds. “Road freight emissions has become a big deal at ports,” Rodriguez said. This project with its mile-long path in Carson, is the first part of a multi-phase project Siemens is seeking support for. South Coast Air Quality Management District is providing funding for this project that will start up next year. Siemens is hoping that its catenary system could be part of a dedicated single lane within 710 freeway’s corridor project set to start up in the next five years. That 12-mile project is still seeking buy-in from cities along that stretch of the freeway and government agencies overseeing the region. The concept is to launch the corridor project in 2020 and complete it in 2030; it’s expected to create 500,000 project jobs and to help reduce harmful emissions. Audi takes on Tesla: Even though reaching out to upscale, climate change-conscious car shoppers probably won’t be enough to take electric vehicle sales to the next level, Audi thinks there’s enough potential in that segment to take on Tesla Motors. In 2017, Audi will be rolling out an electric crossover that will compete with Tesla for business among wealthy, environmentally conscious consumers. It will be a battery-powered version of the $115,900 R8 sports car – Audi’s first battery electric vehicle. It will follow deliveries of the A3 E-Tron plug-in hybrid hatchback this year. Competition with Tesla (and BMW) for the luxury electric car buyer market will be tough. Tesla Model S drivers who recently took a Consumer Reports survey say they’re more likely than Porsche owners (or any other brand) to buy one of these Tesla cars again. The car shopping experience is one of the reasons Tesla drivers are staying very loyal to the brand. Even though most franchised dealers hate Tesla for running their own stores, they are showing an example of what luxury car buyers are expecting from the experience. Major dealer chain Sonic Automotive was recently dubbed the “Tesla of dealers” by Morgan Stanley for giving their customers a faster and better buying experience. Tax credits on AFVs. If you’re looking for tax credits for vehicles running off of compressed natural gas, liquefied natural gas, and propane autogas, there’s good news. The House last week passed HR 5771, the Tax Increase Prevention Act of 2014, which includes a 50-cent per gallon tax credit through the end of this year. That credit had previously expired at the end of 2013, and the US Senate is now reviewing the bill. Simplifying electric vehicle (EV) charging monitoring and reporting. Siemen’s energy management division is working with Duke Energy on the next phase of a US Dept. of Energy-funded project. Siemens has what it says is the first Underwriters Laboratories (UL)-approved residential EV supply equipment (EVSE) to demonstrate the ability to monitor status, report energy use, and be controlled from the local area network and the cloud. That comes out of an 18-month test project to reduce cost and expand charging technologies. British OEMs “onshoring” jobs back to UK. British automakers are expected to create 50,000 new jobs in the UK over the next two years; 63% of them are planning on developing low-carbon or electric vehicle technology. According to a study by Lloyds Bank, 70% of car manufacturers or their supply chain partners plan to return more of their production to the UK; improved economic conditions there and a desire to support local communities are reasons why – along with creating more reliable and shorter supply chains. Ryder System joins Trucking Efficiency. Major fleet management and supply chain company Ryder System is supporting this joint initiative between the Carbon War Room and the North American Council for Freight Efficiency.org provides fleet owners and operators with data on available vehicle technologies and the benefits and challenges of deploying them. More workplace charging. Coca-Cola Company will provide electric vehicle charging at seven of its facilities across California, and NRG eVgo will install and manage them. It’s part of offering support with the state’s goal of bringing 1.5 million zero-emission vehicles to its roads by 2025. Diesel plug-in hybrid. Volkswagen will enter the plug-in hybrid diesel market through its Audi brand. The Audi Q7 will debut next year with gasoline and diesel powertrains, and a plug-in diesel will come later to Europe and the US. Getting NGV support in Washington. Executives from Daimler Trucks, UPS, Clean Energy Fuels, and other companies spoke last week before the US Senate Finance Committee asking for support of federal tax incentives for natural gas vehicles. High-ranking senators agreed that reform is needed on tax and energy policies to level the field for alterative fuels. However, how and when this will take shape was not resolved by the finance committee. Boeing 787 Dreamliner battery fire. National Transportation Safety Board reported that the lithium-ion battery fire last January in a parked Boeing 787 Dreamliner came from design and certification defects. The NTSB is recommending that the Federal Aviation Administration improve guidance and training provided to industry FAA certification engineers on safety assessments and compliance methods. NTSB made 15 safety recommendations to FAA, two to Boeing, and one to battery manufacturer GS Yuasa. Fuel Efficient Military Vehicles. GMZ Energy, which produces high temperature thermoelectric generation (TEG) solutions, announced the successful demonstration of a 1,000W diesel TEG that directly converts waste heat into usable electricity to increase fuel efficiency by reducing the load on the alternator. This announcement follows GMZ’s June 2014 demonstration of its 200W diesel TEG, and marks the next milestone in the $1.5 million vehicle efficiency program sponsored by the US Army Tank Automotive Research Development and Engineering Center (TARDEC) and administered by the US Dept. of Energy. TEG could save the US military billions of dollars per year by increasing fuel efficiency in Bradley Fighting Vehicles, which get less than one mile per gallon.